The latest design contest at Spoonflower is all about geometrics, and creating the design using only two colors (RGB #a7bb7d and #724b64) plus white. I like geometrics, so I thought this would be a fun design to work on, though I never would have picked these two colors on my own. A while ago, Spoonflower had a contest to create a Hawaiian ‘cheater’ quilt design, and I wrote about my design here and about the wall quilt I made from the fabric here. 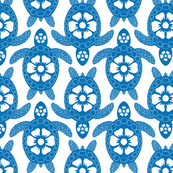 Here’s the original design, using the turtles and flowers of Kauai.